The last laugh – How long before the helmeted hornbill falls silent? I'll never forget the first time I heard the maniacal cackle of a helmeted hornbill. I was standing beneath a massive fruiting fig tree in the middle of the Brunei rainforest – not exactly the heart of Borneo, but it was certainly wild enough for me – and craning my neck to catch a glimpse of the gibbons in the canopy. 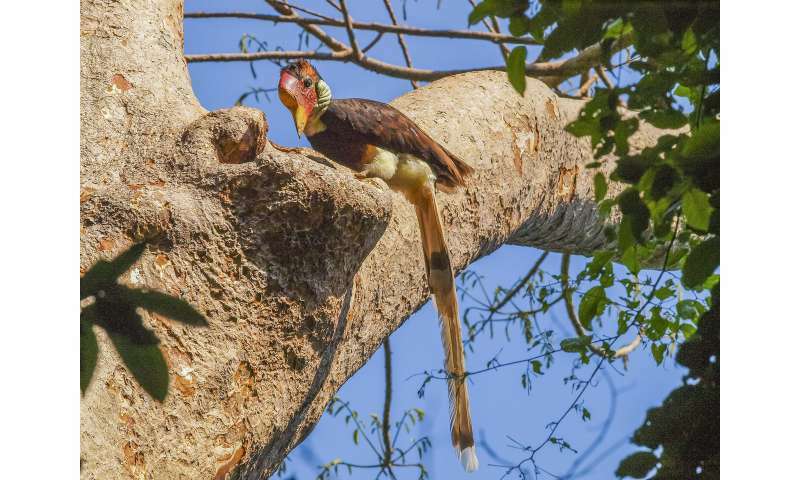 The ripening fruit was a magnet for all manner of other wildlife too, from wild pigs, diminutive mouse deer and tufted jungle king butterflies on the forest floor to pig-tailed macaques, barbets and, yes, hornbills in the treetops. 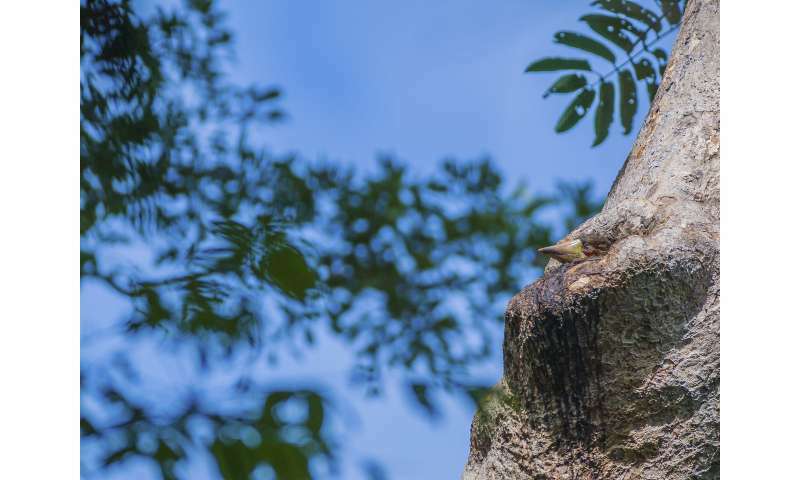 More often heard than seen, Brunei's resident hornbill species are readily identifiable by their characteristic calls or, in the case of the wreathed hornbill, wingbeats reminiscent of the sound of a departing steam train. But it is the helmeted hornbill's madcap laughter that stops you in your tracks. It starts innocuously enough with a few tentative 'poops', but these become increasingly urgent, rising in a crescendo towards a hysterical climax. Back in England, a playback of this ridiculous call was the highlight of every rainforest talk that I inflicted on schoolchildren around the country, providing a suitably entertaining finale to a recording of the rainforest soundscape. The helmeted hornbill's physical appearance isn't exactly conventional either, with its incongruously long central tail feathers and an impressively large casque – from which this bird derives its name. The latter feature in particular has made this species a prime target for illegal wildlife traders. Typically, hornbill casques are light and hollow, but the helmeted hornbill's appendage is a solid, ivory-like block, making it ideal for carving into ornamental trinkets. Increasing demand for such products, combined with rapid deforestation, poses a grave threat to the survival of the species throughout most of its range. The tiny nation of Brunei is an exception to the rule; as an oil-rich country, it can afford not to sell logging or oil palm concessions to the highest bidder, meaning that its magnificent rainforests remain virtually pristine. Strict firearms controls also ensure that poaching is minimal. Elsewhere in Southeast Asia, however, the situation is far less rosy. Severe hunting pressure and widespread habitat loss have led to the helmeted hornbill being officially categorised as Critically Endangered on the IUCN Red List. That's one small step from extinction in the wild. As someone whose spirits were lifted by almost daily encounters with this awesome bird, I'm finding that eventuality difficult to contemplate. 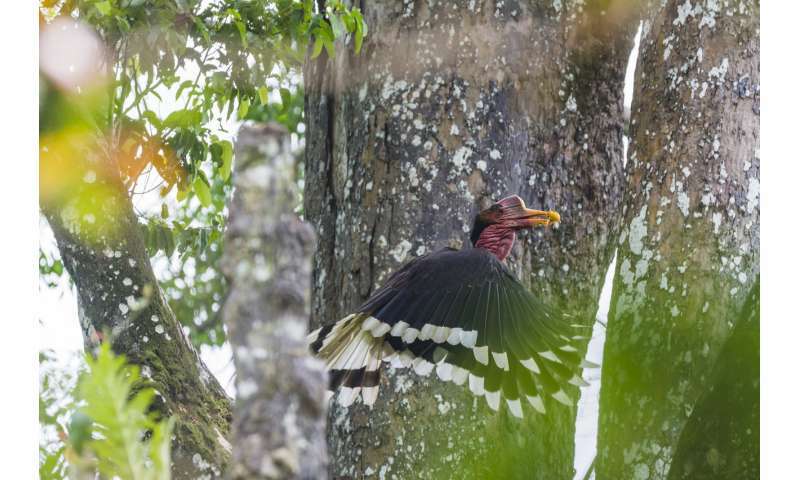 The good news is that helmeted hornbills are benefiting – directly and indirectly – from the work of Fauna & Flora International (FFI) and its partners in Southeast Asia. In Sumatra's Kerinci Seblat National Park, the anti-poaching and forest protection activities of FFI's tiger teams are having a tangible impact on illegal wildlife trade and deforestation, disrupting the trafficking networks that deal not only in tigers and timber, but also in pangolin scales and helmeted hornbill 'ivory'. Closer collaboration between the park authorities and provincial police departments – and the consequent improvements in law enforcement that this brings – are helping FFI and its partners to reduce wildlife and forest crime in and around Sumatra's largest protected area. Organised trade syndicates are fragmenting, black market prices for helmeted hornbill casques have fallen, and traders are less willing to fund hornbill hunting gangs. There is obviously a need for continued vigilance, but these are all encouraging signs. Meanwhile, on the neighbouring island of Borneo, the Conservation Leadership Programme – in which FFI is a leading partner – is supporting a team of Malaysian conservationists who are addressing the shortage of suitable natural nest cavities for hornbills – the result of widespread logging of the largest trees. Nest boxes have been erected in the most promising locations and are being closely monitored for signs of activity. Rhinoceros and wrinkled hornbills are among the species that have already been observed using or checking out these artificial nest sites. The team hopes that continual improvements in the design of the boxes will encourage more birds – including helmeted hornbills – to use them. It's well over 20 years since I last visited Borneo and encountered a helmeted hornbill calling in the wild, but the memory of that extraordinary sound is indelibly etched on my brain. Here's hoping that this bird's lunatic laughter continues to reverberate through Southeast Asia's remaining rainforests long into the future.